After realizing that most of my recent beer reviews have been beers with funny sounding foreign names that are pretty tough to find in Baton Rouge, I decided to flip through my archive and feature a beer that has a funny sounding foreign name but is easy to find, even in Baton Rouge! 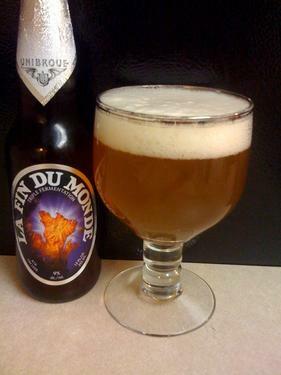 The flagship of the Unibroue brewery in Canada... La Fin Du Monde. Unibroue is out of Chambly, Quebec and they pride themselves in maintaining traditional European brewing methods and bring them to North America. Their specialties are Belgian-style ales (the La Fin Du Monde is a tripel) but also do some dark lagers and fruit-inspired ales. My first encounter came during my first trip 'Around the World' at the Chimes. After starting off with some beers that I knew well I decided to cross Canada off the list and go with this funny sounding beer. I can promise you that at first I didn't like it one bit... way too strong and different for me. 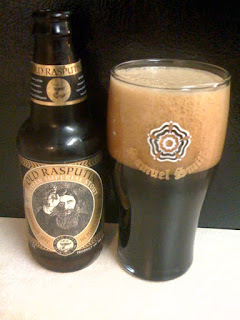 Fortunately as my tastes have developed I've grown to appreciate different beers, and this is one of the world's best. True to the style I poured this one into a goblet, after letting it warm a few degrees from fridge temperature. The beer pours a hazy orange, small white head with good lacing. The smell is a mixture of citrus and hops, hints of floral flavors. Exactly what you want from the style. The taste bring out more of the floral flavors... a little bit of fruit, toasted malts on the end of the sip. I'm not picking up the hop presence from the aroma, but it's still a fantastic beer. A medium body on this one, superbly drinkable... the 9% is masked extremely well by the flavors. A top-notch tripel and one of the best you're going to find outside of Belgium. This one can be find all over Baton Rouge in the better beer bars (like The Chimes, Port Royal, The Cove, and The Bulldog) as well as the stores with the best beer selections. If you want to try one of the beers that helped me get into craft brews, pick one of these up next time you see it. Time for a two-for one review of a couple of smoked beers from Brauerei Heller-Trum / Schlenkerla in Bamberg, Germany! This town is apparently the birthplace of the 'smoked beer' and these are named the 'Aecht Schlenkerla Rauchbier' which translates to Originial Schlenkerla Smokebeer. I picked up two of their brews a while back, the Urbock and Weizen, both brewed in traditional German manner but smoked in the Rauchbier style. Maybe someday soon I'll get back to beers that are named in English... but hey, there is a lot of good beer from around the world to be found even in a place like Baton Rouge! I'll start with the weizen... the head is HUGE... it took a few pours and a little patience to get even 12 oz. into the mug. The beer itself is a dark brown, hazy, looks like there's some sediment in there. The smell is definitely smoky... pork if there is any one flavor in there, but there are also some cooler malt flavors in the aroma. The taste is a lot of the same... thinner than expected based on the smell, but tastes of smoky malty pork, like a thick slab of bacon turned into a quality beer. I'm glad it's a little less smoky than the smell, but there's not enough other flavor coming through in its place. All in all, a solid beer, leaves a little to be desired but still one I'd drink again and recommend to friends. I think this bottle might be a little past its prime... I'll have to remember to try this one again sometime. Now I'm looking forward to the stronger urbock! 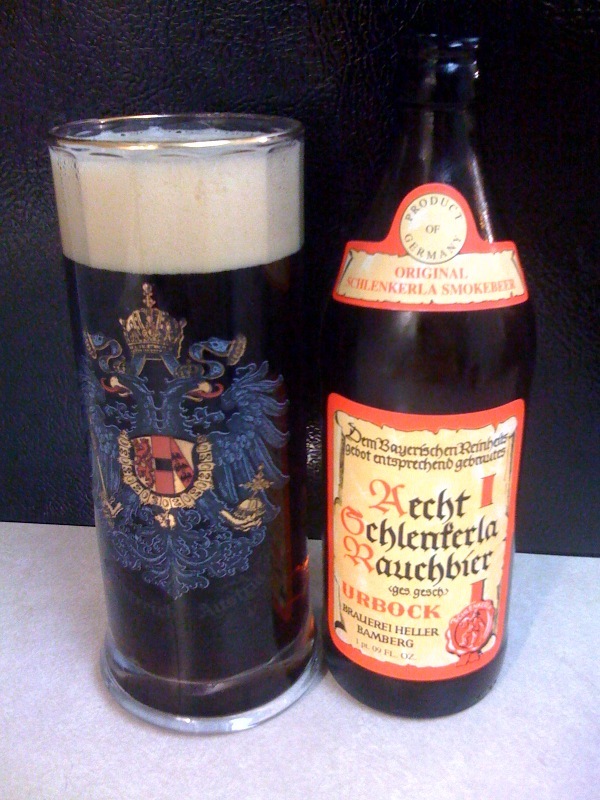 I poured the urbock from the 16.9 oz. bottle into an Austrian glass mug... about time I put that souvenir to good use! It has a dark brown, slightly red-tinged color to it with a nice tan head. A lot more clear than the Weizen, but I guess that makes some sense considering the relative sub-styles. Smells like smoked pork... spicy, meaty, substance... I like it. The taste is really nice... malty and crisp up front, with smoky meaty flavors on the end. A lot more balance to the taste of this one than the weizen variety, the malts come out much more. I'm a fan, time to look out for more rauchbiers from this brewery. If you want to try something a little different, one of these beers might be the way to go! About as close as you can get to a bacon beer. mmmmmm, bacon. 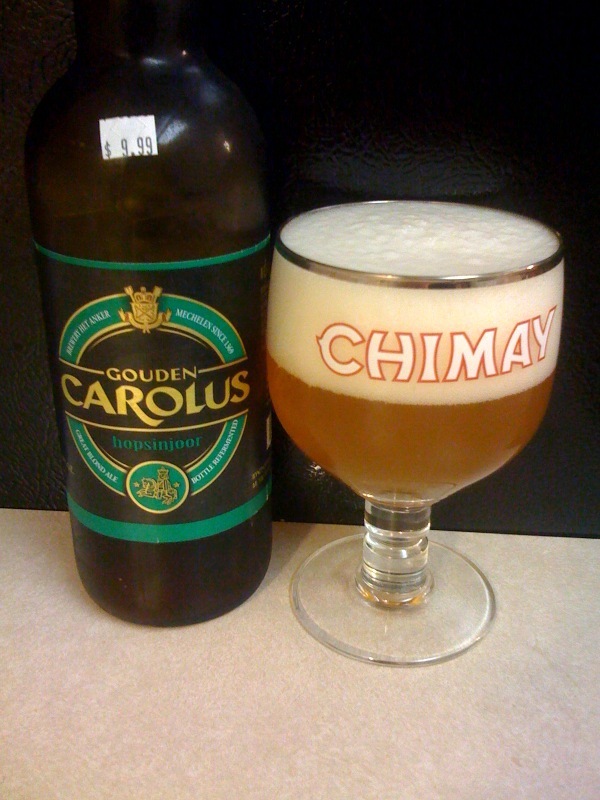 I know what you're thinking... "oh great, another fancy Belgian beer with a foreign name..." but you're wrong! Brasserie Dieu Du Ciel is actually a Canadian brewery with a foreign name! 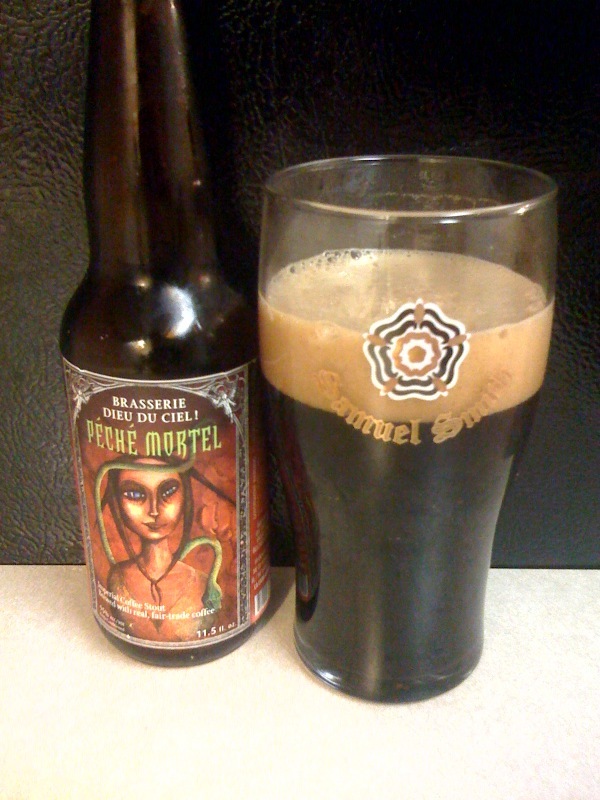 And if you thought that "Péché Mortel" had something to do with peaches, well you're also wrong! According to the brewery website it means "mortal sin" although I'm not sure why they named it that... I don't think drinking this ridiculous coffee-infused imperial stout is a sin at all. If it is, then I am in trouble. T-R-U-B-B-L trouble. On to the beer itself... I poured from it from the bottle into an imperial pint glass. The beer is a dark chocolate color with a strong head, little disspiation and a good bit of lacing. Looks tasty, that's for sure. The aroma is pure coffee. This take 'coffee stout' to the extreme on the nose, with hints of chocolate behind. The taste is more of the same... BOLD coffee overtones dominate the beer, the chocolate stout is an afterthought. It's really pretty good, I promise! Give this one a try if you get the chance, I promise you will enjoy. Especially if you like coffee AND beer separately, why not enjoy them together? This is another one that's in the BeerAdvocate top 100 beers on planet earth, and you should be able to find it at Calandro's or maybe a few other places with a great beer selection. If they don't have it, ask them to get some, I found it in town, so it must be available to distribute! And apparently they also make one aged in bourbon barrels... I need to find that. North Coast Brewing has been in Louisiana for a little while now and I couldn't be happier! Their beers can be found at Calandro's among other local stores with a good beer selection. I've previously featured their Brother Thelonious and Cru D'Or and this one is one of their more popular beers, the Old Rasputin Russian Imperial Stout. The style is characterized by high alcohol contents, and a heavy malt presence. Much more rich and thick than something like a Guinness but typically more bitter and chocolaty than high-alcohol malty beers like doppelbocks. It's definitely not a style for someone getting into craft beer for the first time, but it has slowly become one of my favorites. This one was poured from a 12 oz. bottle into my trusty Samuel Smith imperial pint glass. It featured a dark chocolaty brown color with a tan head that lingered throughout the drinking. Very nice appearance to this one and a great start. The aroma is a dominant malty chocolate. Delicious. The taste follows through on the aroma. A little bit muted though... I wish more malty chocolate flavors came through. A little thinner than I was hoping for with the style. This is a strong one too... at 9% I wouldn't WANT to drink a lot of these in one sitting, but it's certainly good enough to think about it. This is one of the better Russian Imperial Stouts we can get locally, so if you want to check out the style, pick up a 4-pack and share some with your friends! Time for a new style to me or my blog... a Belgian IPA. When people typically think of the IPA style they think of American IPAs, commonly brewed out on the west coast featuring a heavy hop flavor. The Belgian version of the style is inspired by the American brewers in a bit of a role reversal. Think of an American IPA with belgian yeast strains, bottle conditioned and most likely unfiltered. Sounds good to me! This particular one hails from the Brouerij Het Anker,which according to their website opened in 1369. That's not a typo. 13... as in a long time ago. Other notable events of 1369 include King Charles V of France declaring war on England, the Turks invading Bulgaria, the pogo stick being invented, and James Lawson being born. As for the beer itself, I poured it from a 750 ml bottle into my trusty Chimay goblet... hazy golden color with a massive white head. Definitely an unfiltered brew, with great retention and lacing on this one. Smells of hops, for sure... sweet delicious hops. Also hints of citrus on the nose. Very nice. The taste is bitter citrus up front, fading to the hops on the end. Good carbonation, hoppy aftertaste, a little like grapefruit at the end. A little bit bitter for my taste, but still a very good beer. I'll definitely be on the lookout for more Belgian IPAs to serve as a comparison. It's always good to see events like this one popping up in South Louisiana. Sure, there may be a heavy BMC presence, but this festival also features beers from many local breweries and some of my favorite American and European breweries. 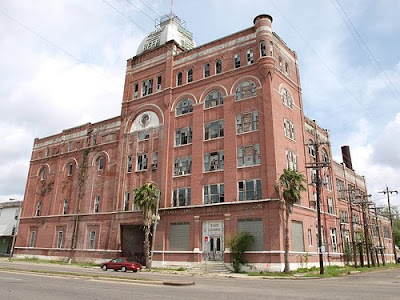 There is a large assortment of breweries that would be worth tasting, including imports from Ayinger, Chimay, Samuel Smith, and Unibroue; American craft beers from Bear Republic, Eel River, North Coast, ans Stone; plus local beers from Abita, NOLA, Lazy Magnolia, and Heinerbrau. I've even heard that Parish Brewing might have some of their new beer available in the VIP area, so that's something to consider! Unfortunately I won't be able to make it out this Saturday, but anyone looking to try some new beers should check it out!